Whenever the summit of the mountains ... shall prove to be at the distance of more than ten marine leagues from the ocean, the limit ... shall be formed by a line parallel to the winding of the coast, and which shall never exceed the distance of ten marine leagues therefrom. This part of the treaty language was an agreement on general principles for establishing a boundary in the area in the future, rather than any exact demarcated line. Signed in 1839, the RAC–HBC Agreement created an understanding between the Russian-American Company and the Hudson's Bay Company. Typically referred to as the lisière (edge), a stretch of the Alaskan Panhandle from Cross Sound to 54° 40′ was given to the HBC as a fur trade monopoly in exchange for the agricultural and pastoral products produced by its subsidiary, the Puget Sound Agricultural Company, along with an annual amount of furs given to the Russian company. The lease was renewed until the end of Russian America. This lease was later brought up by the Province of British Columbia as bearing upon its own territorial interests in the region, but was ignored by Ottawa and London. 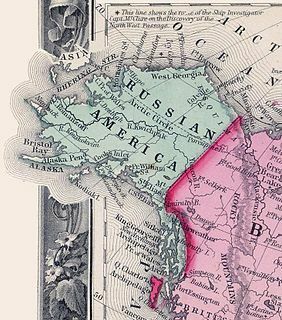 The United States bought Alaska in 1867 from Russia in the Alaska Purchase, but the boundary terms were ambiguous. In 1871, British Columbia united with the new Canadian Confederation. The Canadian government requested a survey of the boundary, but the United States rejected it as too costly; the border area was very remote and sparsely settled, and without economic or strategic interest. In 1898, the national governments agreed on a compromise, but the government of British Columbia rejected it. U.S. President McKinley proposed a permanent lease to Canada of a port near Haines, but Canada rejected that compromise. In 1897–98 the Klondike Gold Rush in Yukon, Canada, enormously increased the population of the general area, which reached 30,000, composed largely of Americans. Some 100,000 fortune seekers moved through Alaska to the Klondike gold region. The presence of gold and a large new population greatly increased the importance of the region and the desirability of fixing an exact boundary. Canada wanted an all-Canadian route from the gold fields to a seaport. There are claims that Canadian citizens were harassed by the U.S. as a deterrent to making any land claims. The head of Lynn Canal was the main gateway to the Yukon, and the North-West Mounted Police (NWMP) sent a detachment to secure the location for Canada. This was based on Canada's assertion that that location was more than ten marine leagues from the sea, which was part of the 1825 boundary definition. A massive influx of American stampeders through Skagway very quickly forced the Canadian police to retreat. They set up posts on the desolate summits of Chilkoot and White Passes, complete with a mounted Gatling gun at each post. This was still disputed territory, as many Americans believed that the head of Lake Bennett, another 12 miles (19 km) north, should be the location of the border. To back up the police in their sovereignty claim, the Canadian government also sent the Yukon Field Force, a 200-man Army unit, to the territory. The soldiers set up camp at Fort Selkirk so that they could be fairly quickly dispatched to deal with problems at either the coastal passes or the 141st meridian west. The posts set up on the passes by the NWMP were effective in the short term, as the provisional boundary was accepted, if grudgingly. In September 1898, serious negotiations began between the United States and Canada to settle the issue, but those meetings failed. The treaty of 1825 was drawn up in French, and the 1903 British advocates discussed the exact meaning of words like "côte/coast", "lisière/strip" and "crête/crest". The maps of George Vancouver, which were used as a fixing line by the commission of 1825, showed a continuous line of mountains parallel to the coast — however, the mountain range is neither parallel to the coast nor continuous. Finally, in 1903, the Hay–Herbert Treaty between the United States and Britain entrusted the decision to an arbitration by a mixed tribunal of six members: three Americans (Elihu Root, Secretary of War; Henry Cabot Lodge, senator from Massachusetts; and George Turner, ex-senator from Washington), two Canadians (Sir Louis A. Jette, Lieutenant Governor of Quebec; and Allen B. Aylesworth, K.C., from Toronto), and one Briton (Baron Alverstone). All sides respected Root, but he was a member of the U.S. Cabinet. Canadians ridiculed the choice of the obscure ex-Senator Turner and, especially, Lodge, a leading historian and diplomatic specialist whom they saw as unobjective. What "Portland Channel" meant, and how to draw the boundary line through it. Four islands were in dispute. The definition of the line from "the southernmost point of Prince of Wales Island to Portland Channel", which depended on the answer to the previous question. The line from Portland Channel to the 56th parallel north. The width of the lisière (border or edge), and how to measure it. Whether mountain ranges existed in the area. The British member Lord Alverstone sided with the U.S. position on these basic issues, although the final agreed demarcation line fell significantly short of the maximal U.S. claim (it was a compromise falling roughly between the maximal U.S. and maximal Canadian claim). The "BC Panhandle" (the Tatshenshini-Alsek region) was not quite exclaved from the rest of British Columbia. there can be little doubt that the tribunal in this instance accepted a compromise, which, however justified by the political considerations involved, was a direct violation of the judicial character of the court. Instead of accepting either the American or the British claim in toto, the line was drawn through Tongas Passage, thus giving each country a portion of its claim, but entirely disregarding the real problem involved. The original negotiators might, logically, have intended the line to be drawn either as the British claimed or as the Americans claimed; certainly they had no intention of dividing the channel islands between the two ... There can be scarcely any doubt that Lord Alverstone's final pronouncement was merely an attempt to rationalize a political expedient ... In all but one case they seem justified by the facts, and yet that one case of political compromise tarnished the whole award. This was one of several concessions that Britain offered to the United States (the others being on fisheries and the Panama Canal). It was part of a general policy of ending the chill in Britain–U.S. relations, achieving rapprochement, winning American favour and resolving outstanding issues (the Great Rapprochement). Had the United States been willing to submit her case to The Hague, or to an impartial juridical body, as Canada had desired, the result would have been, in all probability, substantially the same, except that Canadians could not feel that they had been unfairly treated. ... Had justices of the United States Supreme Court been appointed in the place of the two Senators, Canadian criticism of the award would not have been audible. The Canadian judges refused to sign the award, issued on 20 October 1903, due to the Canadian delegates' disagreement with Lord Alverstone's vote. Canadians protested the outcome, not so much the decision itself but that the Americans had chosen politicians instead of jurists for the tribunal, and that the British had helped their own interests by betraying Canada's. This led to intense anti-British emotions erupting throughout Canada (including Quebec) as well as a surge in Canadian nationalism as separate from an imperial identity. Although suspicions of the U.S. provoked by the award may have contributed to Canada's rejection of a free trade with the United States in the 1911 "reciprocity election", historian F. W. Gibson concluded that Canadians vented their anger less upon the United States and "to a greater degree upon Great Britain for having offered such feeble resistance to American aggressiveness. The circumstances surrounding the settlement of the dispute produced serious dissatisfaction with Canada's position in the British Empire." Infuriated, like most Canadians, Prime Minister Wilfrid Laurier explained to Parliament, "So long as Canada remains a dependency of the British Crown the present powers that we have are not sufficient for the maintenance of our rights." Canadian anger gradually subsided, but the feeling that Canada should control its own foreign policy may have contributed to the Statute of Westminster. ^ Farr, D. M. L. (February 6, 2006). "Alaska Boundary Dispute". The Canadian Encyclopedia. Retrieved October 10, 2014. ^ "Alaska Boundary Dispute". 2009. ^ Statement of facts regarding the Alaska boundary question, p.3487 Alexander Begg, Victoria, British Columbia, publ. R. Wolfenden, 1902 Archived 2011-05-27 at the Wayback Machine, report to David McEwen Eberts, Attorney-General of British Columbia. ^ Brown, John W. (1909). An Abridged History of Alaska (1 ed.). Author. ^ a b c d e f g h i Keenlyside, Hugh L. L.; Brown, Gerald S. (1952). 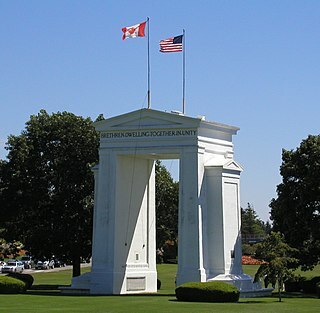 Canada and the United States: Some Aspects of Their Historical Relations. Alfred A. Knopf. pp. 178–189. ^ John A. Munro, "English-Canadianism and the Demand for Canadian Autonomy: Ontario's Response to the Alaska Boundary Decision, 1903." Ontario History 1965 57(4): 189–203. Bailey, Thomas A. "Theodore Roosevelt and the Alaska Boundary Settlement," Canadian Historical Review (1937) 18#2 pp: 123-130. Penlington, Norman. The Alaska Boundary Dispute: A Critical Reappraisal. McGraw-Hill Ryerson, 1972. 120 pp. 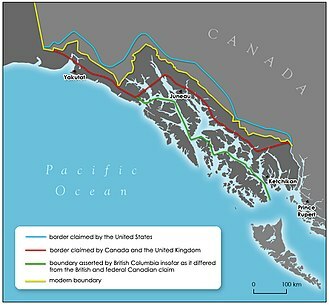 Statement of facts regarding the Alaska boundary question, Alexander Begg, Victoria, British Columbia, publ. R. Wolfenden, 1902, report to David McEwen Eberts, Attorney-General of British Columbia. Survey of boundary line between Alaska and British Columbia : letter from the Acting Secretary of the Treasury, transmitting a communication from the Secretary of State, submitting an estimate of appropriation for survey of the boundary line between Alaska and British Columbia, R.Wike, US Dept. of State, publ. s.l. : s.n., 1895. The North-Western Territory was a region of British North America until 1870. Named for where it lay in relation to Rupert's Land, the territory at its greatest extent covered what is now Yukon, mainland Northwest Territories, northwestern mainland Nunavut, northwestern Saskatchewan, northern Alberta and northern British Columbia. Some of this area was originally part of Rupert's Land due to inaccurate maps. The acquisition of Rupert's Land was the largest land purchase in Canada's history. Mount Hubbard is one of the major mountains of the Saint Elias Range. It is located on the Alaska/Yukon border; the Canadian side is within Kluane National Park and Reserve, and the American side is part of Wrangell–St. Elias National Park. The mountain was named in 1890 by U.S. Geological Survey geologist Israel Russell after Gardiner Greene Hubbard, first president of the National Geographic Society, which had co-sponsored Russell's expedition. 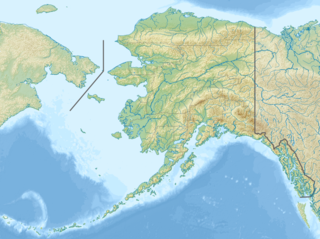 The Dixon Entrance is a strait about 80 kilometres (50 mi) long and wide in the Pacific Ocean at the Canada–United States border, between the U.S. state of Alaska and the province of British Columbia in Canada. It was named by Joseph Banks for Captain George Dixon, a Royal Navy officer, fur trader, and explorer, who surveyed the area in 1787. The Dixon Entrance is part of the Inside Passage shipping route. It forms part of the maritime boundary between the U.S. and Canada, although the location of that boundary here is disputed. A name used in the Haida language is Seegaay, which means only "ocean". Clarence Strait, originally Duke of Clarence Strait, is a strait in southeastern Alaska, in the United States in the Alexander Archipelago. The strait separates Prince of Wales Island, on the west side, from Revillagigedo Island and Annette Island, on the east side. Clarence Strait is 126 miles (203 km) long, extending from Dixon Entrance to Sumner Strait. Moira Sound is on the west side of the strait. The Stickeen Territories, also colloquially rendered as Stickeen Territory, Stikine Territory, and Stikeen Territory, was a territory of British North America whose brief existence began July 19, 1862, and concluded July of the following year. The region was split from the North-Western Territory in the wake of the Stikine Gold Rush. The initial strike attracted large numbers of miners — mostly American — to the region; by detaching the region from the exclusive trade zone of the Hudson's Bay Company, British authorities were able to impose tariffs and licences on the speculators. The new territory, named after the Stikine River, was under the responsibility of the Governor of the Colony of British Columbia, James Douglas, who was appointed "Administrator of the Stickeen Territories" and under British law, within the jurisdiction of the Supreme Court of British Columbia. Mount Alverstone or Boundary Peak 180, is a high peak in the Saint Elias Mountains, on the border between Alaska and Yukon. It shares a large massif with the higher Mount Hubbard to the south and the slightly lower Mount Kennedy to the east. The summit of Mount Alverstone marks a sharp turn in the Alaska/Canada border; the border goes south from this point toward the Alaska panhandle and west toward Mount Saint Elias. Dall Island is an island in the Alexander Archipelago off the southeast coast of Alaska, just west of Prince of Wales Island and north of Canadian waters. Its peak elevation is 2,443 feet above sea level. Its land area is 254.0 square miles (657.9 km2), making it the 28th largest island in the United States. Dall is used economically for fishing and limestone quarrying. Wales Island is an island on the North Coast of British Columbia, Canada, situated east of the Dixon Entrance at the entrance to Portland Inlet. Mount Aylesworth, also named Boundary Peak 176, is a mountain in Alaska and British Columbia, located on the Canada–United States border, and part of the Southern Icefield Ranges of the Saint Elias Mountains. It is named after Sir Allen Bristol Aylesworth (1854–1952), Canadian constitutional lawyer and member of Alaskan Boundary Tribunal, and who was involved in settling the Alaska boundary dispute between the United States and Canada. Mount Armour, also named Boundary Peak 175, is a mountain in Alaska and British Columbia, located on the Canada–United States border, and part of the Southern Icefield Ranges of the Saint Elias Mountains. It is named after John Douglas Armour (1830–1903), Chief Justice of the High Court of Ontario, and Justice of the Supreme Court of Canada, one of the original Canadian members of the Alaskan Boundary Tribunal in 1903 and who was involved in settling the Alaska boundary dispute between the United States and Canada. Mount Jetté, also named Boundary Peak 177, is a mountain in Alaska and British Columbia, located on the Canada–United States border, and part of the Southern Icefield Ranges of the Saint Elias Mountains. It is named in 1908 for Sir Louis-Amable Jetté, (1836-1920), a member of the 1903 Canadian Boundary Tribunal, leading to the resolution of the Alaska Boundary Dispute, and Lieutenant Governor of the Province of Quebec from 1898 to 1908.